• A single piece self-contained pump station combining the tank compartment for water storage with the dry compartment which houses the pump set and or any other equipment. • All pipework connections between the tank compartment and pump set within the unit. • Requires only inlet, outlet, overflow and the electrical supply connecting to and from the unit, ensuring "plug and play" easy site installation. • Large lockable access door for increased security. • Mounted on a heavy duty galvanized steel skid to allow external positioning. • Most units can be positioned using fork lift trucks, larger units may require crane lift. • Available with AB air gap option. • Available with actual storage capacity options of 1000, 2000, 3000, 5000 or 7000 litres. • Prices detailed are for the housing unit including water storage tank only and do not include the pump set. • Actual storage capacity required. • Connections type and sizes required. • Size of the booster set being utilised. • Details of any access restrictions to enable positioning of the unit. 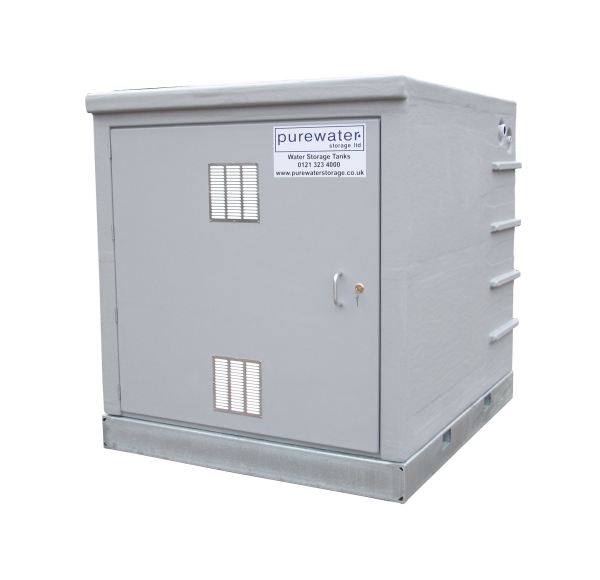 To find out more about our Above ground combination pump station options, or any of the other products listed on our website, please don't hesitate to get in touch with our friendly team here at Purewater Storage, by giving us a call on 0121 323 4000 today.